Ball control soccer drills for kids have to include lots of touches on the soccer ball, with different parts of the foot, and direction change with the ball. When coaching youth soccer players, I always encourage players creativity and flair while the players focus on my exercise, allowing them to add different touches, rolls or turns on their own. The ball rarely stops, and there are constant touches applied, and encouraged by the coach. Ball control soccer drills are focused on keeping the ball close, so that the player forms a habit to control the soccer ball with multiple touches and close to feet, opposed to heavy touches; where the ball is exposed to defenders. ITS YOUR BALL, PROTECT IT! Over time, various ball control soccer drills will help players develop touch on the soccer ball through repetition in training and games. Time allows players to see empty space, other teammates on the field, and make better decisions in the game. After all, it is a very fast paced game... Ball control gives players more time on the ball. Once a player feels comfortable with the soccer ball, they will use their first touch to move with the ball, and expose empty space on the field; or make a different decision to better impact the game. After 5 - 10 minutes of juggling the soccer ball, move into getting more familiar with the soccer ball through 1000's of touches and different parts of the foot. Take water breaks as needed, but work hard and REALLY CONCENTRATE on the touches and contact with the ball. Tap Tap Roll or Toe Touches with a Roll x 60 - 90 sec. Right Toe Touch, Left Toe Touch, Right Roll Across Body... Continue with Left Toe Touch, Right Toe Touch, Left Roll Across Body. Try to find a rhythm and do it continuously without stopping. Triangles x 60 - 90 sec. Pull the ball back with the sole of the right foot, and pass it with the inside of the same foot behind the heel of the standing foot. Continue with the left foot. Gates with a Roll x 60 - 90 sec. Touch the soccer ball with the inside of both feet and add a roll across body every 3th or 5th touch on the ball. 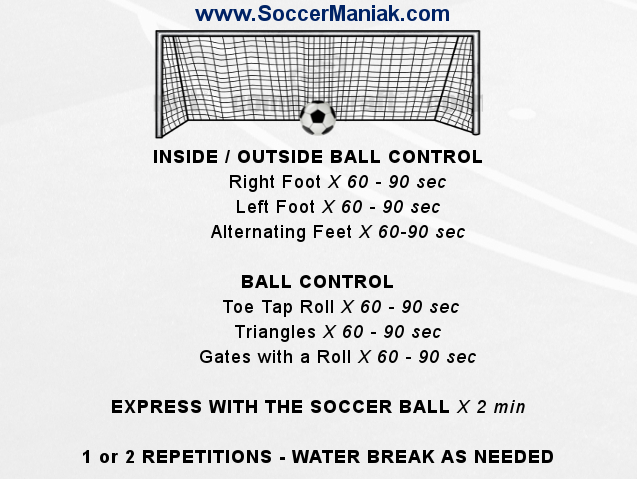 After you have finished 1 or 2 repetitions, take 2 minutes to express yourself with the soccer ball. Dribble the ball and get creative with your touches; try different skills and tricks with the ball. When doing the Inside/Outside Touches move the soccer ball in a zig zag motion, across your body, rather than kicking the ball forward. Get creative and add another move like rolling the ball, stepover, scissor or any other soccer move. Stay on your toes. Its a great habit to create, as it makes you lighter and faster on your feet as you get older and heavier. Quick touches on the ball for faster ball movement. NO WALKING. Super slow jog to stay on your toes for faster reaction.